Cooking doesn’t have to be complicated. Everyone has favorite things to eat that are the simplest things to make. 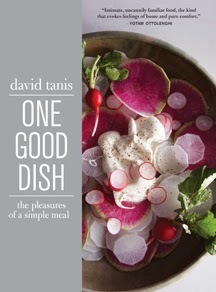 David Tanis’ latest book, One Good Dish , is a collection of some of his favorites. I received a review copy of the book. He writes in the intro: “There are many good reasons to stay home and cook. And, even though we may not always have the energy to invest in a complex meal, making one simple, delicious dish (maybe two) is certainly manageable. One good dish, carefully prepared and eaten with pleasure, is an end—and a delight—in itself.” Indeed, the book is full of dishes for snacks, small meals, soups, sides, entrees, sweets, and drinks that look delightful. The inspiration comes from childhood memories and food from all around the world. There isn’t a strict adherence to traditional approaches. Instead, these are dishes borrowed for flavors, possibly adapted for ease, and made simply delicious. For instance in the chapter for dishes made with bread, the Waffle-Iron Grilled Cheese was Tanis’ favorite childhood sandwich made by his aunt. Here, it’s shown in his current, preferred version with grown-up cheeses and good bread. The Vietnamese Vegetable Baguette is based on the concept of the bahn-mi, but this one is built with just the pickled vegetables and topped with avocado and hard-cooked eggs. In the snacks chapter, there’s a Tomato and Egg Salad that I can’t wait to make next summer. It’s just a thick slice of tomato topped with homemade mayonnaise and a quartered, medium-cooked egg. I already tried and loved the Mackerel Rillettes. I’ve seen many versions of similar spreads made with smoked salmon, but this was the first I’d seen made with smoked mackerel. It was buttery, lemony, and herby with great smoked fish flavor. I served it with crostini on Thanksgiving. One more dish I want to try soon is the After-Dinner Dates. There are two versions. One involves stuffing pitted dates with whipped creme fraiche flavored with orange and lemon zest and then sprinkled with chopped pistachios. The other version is made with almond paste. Since we seem to actually be having chilly weather this year, and it came early, another dish I wanted to try was the Polentina alla Toscana. It’s a hearty, vegetable soup thickened with polenta. It starts like a lot of soups with onion, carrots, celery, and fennel being cooked. Next, leeks and a bay leaf were added. Then, just a quarter cup of polenta was added before the stock was stirred into the vegetables. It simmered for about an hour. Separately, kale was sauteed with chopped garlic and red pepper flakes and was then used to top the soup after it was ladled into bowls. The final garnish was chopped rosemary and a drizzle of olive oil. It was perfect soup for a cold day. There’s an ease about these recipes that draws me straight to the kitchen. But, in addition to being straightforward to prepare, the dishes are also interesting and varied. It’s the kind of book that will make you think about your favorite dishes and how to make them even better, and it will give you several more dishes to add to your favorites list. Recipe reprinted with publisher’s permission. Excerpted from One Good Dish by David Tanis (Artisan Books). Copyright © 2013. Photographs by Gentl and Hyers. Some soups, once encountered, live on in both memory and a cook’s personal repertoire. 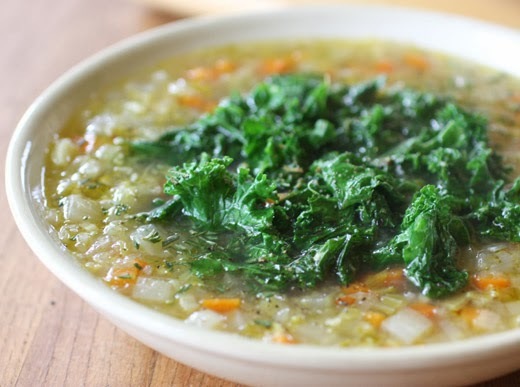 This very traditional Tuscan soup impressed me when I first encountered it in Florence. I loved the way a little polenta could be used to thicken, ever so slightly, a vegetable soup. There was something special too about the deep, dark kale and fruity olive oil that were added to the bowl. My version is faithful to the original, so good that there was no need to embroider. In a heavy pot, heat 2 tablespoons of the olive oil over medium-high heat. Add the onion, carrots, celery, and fennel, season generously with salt and pepper, and cook, stirring, for 5 minutes or so, until barely softened. Add the leek and bay leaf and cook for 2 minutes. Add the polenta, stirring to distribute it, and raise the heat to high. Add the chicken broth and bring to a boil, then reduce the heat to a gentle simmer and allow the soup to simmer for about an hour; the broth should be just slightly thickened. Taste and adjust the seasoning. Meanwhile, wash and roughly chop the kale. Drain in a colander but do not dry. Heat the remaining 2 tablespoons olive oil in a wide skillet over high heat. When the oil is hot, add the greens, stirring as they begin to wilt. Add the garlic and red pepper flakes and season with salt and pepper. Turn the heat to medium, cover, and cook until the greens are tender, about 5 minutes more. Set aside. 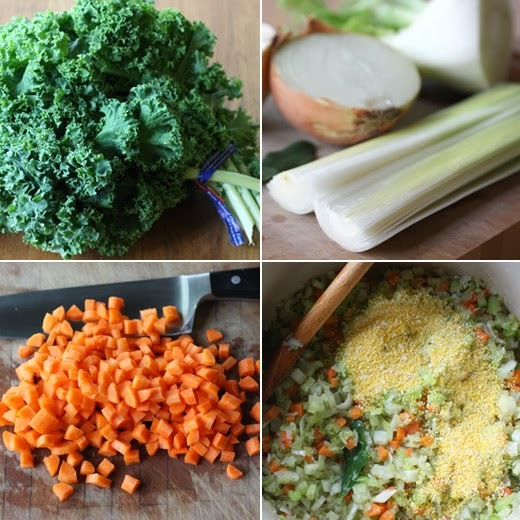 To serve, ladle the soup into bowls and top with the kale. Sprinkle with the chopped rosemary (finely chop it at the last minute), and drizzle with more olive oil if desired. Thickening with polenta!!! What a great idea! Love the idea of thickening with polenta. Sounds hearty and comforting! This looks like such a nice, hearty dish - the perfect comfort food!! Can't wait to make this recipe when winter comes around here (then again, why wait!?). Thanks for sharing this recipe! Oh does that look great! I adore polenta but have never thought to use it in soup! And we love Italian soups and this one looks and sounds wonderful, especially in this season. Bookmarked. My kind of food too! Looks comforting and tasty. What a wonderful recipe for this time of year: warming, satisfying, and colorful -- even though it isn't colorful outdoors :) Thanks for this, Lisa. What a lovely soup! The simplicity and homey quality to it is quite enticing. I’m thinking this needs to be my brunch!! 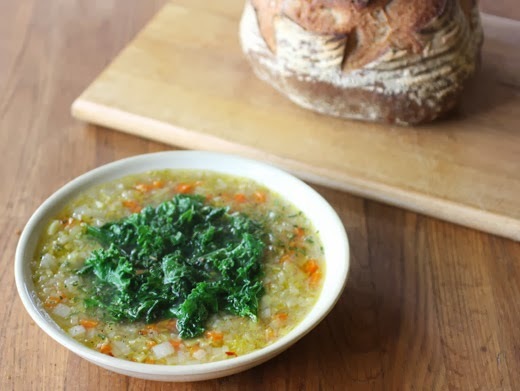 I've never used polenta to thicken a soup - love the idea! Kinda like using masa harina, I guess - which I have done. Love the flavors in this - really nice combo. Gorgeous looking dish - thanks. This sounds like a hearty and warming soup…much welcomed with all the cold weather we are having. I still can't believe that my mum used to work a job and then come home and make us three dishes every night. I do one dish, maybe two and it's my job to make them. I definitely like the one dish concept! I love dishes like these -- filled with hearty veg, and comforting flavours. And I agree, simple dishes are often the ones you keep wanted to come back to. Love this hearty soup...so comforting and satiating. neat trick for polenta! as i sit here shivering in my cold apartment, i could really go for some soup like this. This dish looks really simple yet delicious and warming - perfect for this cold weather. I never though to use polenta in soup and it's really a great idea! The book sounds wonderfful! It's so cold now, I wish I had a plate of delicious soup like this one right now!